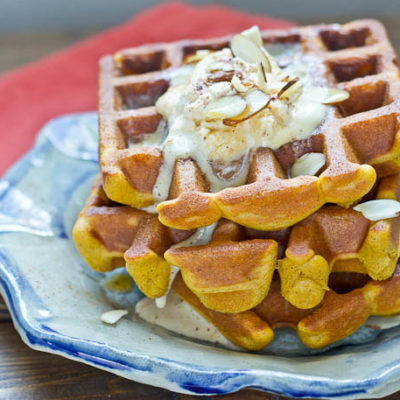 These Pumpkin Waffles boast of fall flavors and are made in the BLENDER!! They are decadent, fluffy, and pumpkiny. Don’t make them without the Pumpkin Spice Cream… it’s melt in your mouth yum yum. Pre heat non stick waffle iron. Place all waffle ingredients in a blender and blend until all ingredients are covered. Once waffle iron is preheated, pour mixture onto iron and cook until waffle maker indicates they are done! In a mixing bowl, place all whipped cream ingredients and whisk on high power until stiff peaks are formed, will take a few minutes. Top each waffle with a dollop of whipped cream and serve with a sprinkle of almonds and pure maple syrup if desired.